​For Android and iOS users Sustainability Shuffle works differently. Teachers are encouraged to download the .MCWORLD file below which is void of Minecraft Education Edition elements. 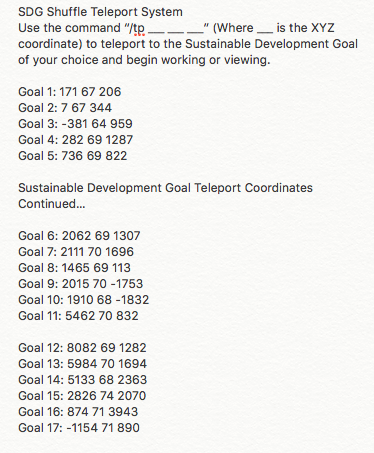 Teachers are encouraged to introduce students to the United Nations' Sustainable Development Goals for 2030 using some or all of the resources below. Teachers are encouraged assign a Sustainable Development Goal to each student or student pair (Ensuring all are addressed) and allow them to have some time working on their village. Again the goal remains for students to be able to demonstrate their understanding of the goal and build and describe solutions which they feel may lead to achieving the goal by 2030. Minecraft Pocket Edition Realms might help this process as it allows up to 10 students to work on the world file collaboratively. However, this project could also be done in the single-device classroom by allowing students time to work on their part of the world throughout the term or year! Teachers are encouraged strongly to upload their completed world file to a cloud storage drive and share the link with @PlayCraftLearn @BBTNB and others OR to contact @BBTNB (Ben@BBTNB.com) who will provide a cloud storage drive space for all the builds from schools. Once worlds are uploaded and COLLECTED into a single OneDrive, classes are encouraged to download other world files from other parts of the world and review these other examples of student understanding!